Brother Halstead is a faithful man of God! He has a call of God upon his life to preach the gospel and is passionate in both his love for people and in reaching the lost with this unalterable message of the Gospel. He is a graduate of the Institute of Conservative Apostolic Theology (ICAT), San Antonio, Texas, and his wife at Theresa recently graduated with a Certificate of Biblical Studies at ICAT as well. She works side-by-side with her husband in the outreach program. Brother Halstead directs our coordinated outreach efforts and serves to remind us all of our duty as Apostolic Christians to be always witnessing the gospel message everywhere we go. He is also heading up an effort to develop our in-house Discipleship Program. 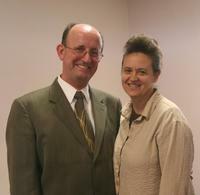 He and his wife Theresa also both work very hard helping our Kid's Church program with their teaching skills. They are great at it! Their faithfulness and genuine caring spirit is evident to everone who meet them! The Halstead's have retired from their secular careers and are dedicating ever more time to the service of the Lord here at Cornerstone Pentecostal Church. Sister Halstead helps in our school, Lighthouse Christian Academy of Oakley.